Not often that we get to review a new magazine, especially one that stands as far outside the mainstream as the Art of Angling. If you know Paul Schmookler and Ingrid Sil’s work, this new title will come as no surprise, because what you get is a reprise of the Rare and Unusual books, only this time in magazine format. Lush to the point of intimidation, full colour is used throughout; this being one of the few mags I have ever seen which has dared to use gold on the cover. Each issue is over a hundred and sixty large format pages, so think “book” and you will get the idea. 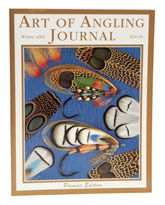 First issue articles ranged from an investigation into the death of Edmund Davis on the Grand Cascapedia (get the Flyfisher’s Classic Library reprint if you have never read about this extraordinary river), through a lavishly illustrated section on fly tying ornithology; to an essay by Gordon Wickstrom on the rise of angling crafts. If you enjoy fly fishing, you will enjoy this, just make sure you don your shades before you open the first page. The Art of Angling crashed to a sudden and sad end, but the remaining stock is held by Coch-y-Bonddu Books and my judgement is that it would be by no means a bad investment as it will become highly collectible.